Oh.. Yeah.. 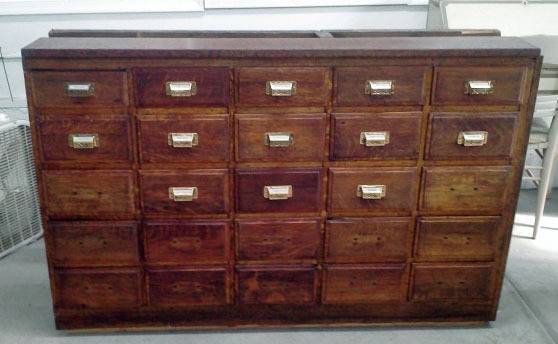 I Got an Antique Apothecary Chest at a YARD SALE! – Uniquely Yours… or Mine! Oh.. Yeah.. I Got an Antique Apothecary Chest at a YARD SALE! Sorry if you already read this, it was a draft that went out by mistake.. hey, I’m still learning y’all! But seriously… I can NOT possibly express how ELATED I was when I got this beauty! The whole thing went down like this… Saw an ad on CL for a table at a local yard sale, I dragged convinced my neighbor to go with me, got to yard sale, no table, no real furniture, a few other people that’s it.. Until I snooped looked in the garage and saw a HUGE Tiger Oak apothecary chest… Seriously it was in two sections 9 drawers across by 5 drawers down! I had no idea if it was for sale or not, but I asked anyway.. ’cause you don’t get what you don’t ask for right? The owner said she had bought it several years ago at a very reputable (awesome) local salvage company and had paid $1,000 for the whole thing.. Ok at this point in her story I pretty much figured uh..uh.. no way will I be able to afford this.. so I asked how much did she want for the section that was 5 drawers across (the larger of the two sections).. it was missing several pulls & half of the side and top.. she thought about it and threw out “How about $100?” What? Did I hear that correctly? (me) “How about $90?” Sold! I would have paid $200 and it was worth way more than that! Part of the side and top were missing because there was a HUGE set of shelves that spanned both pieces and sat on top of the chests. But I didn’t want that… Seriously it made the piece almost 9 feet tall! So some super awesome guys loaded it into the car and just as I was ready to get in the car my neighbor decides that she wants the other side! The lady sold her that piece for $75! It had the same wood problems with the top & side, but it had all of the pulls! So the guys loaded it on top of mine and off we went… extremely excited about our yard sale score!! Ok… So here is where the story gets typical for me…MONTHS go by and neither of us has done anything to the chests.. she said she was waiting to see what I was going to do and I was waiting for an inexpensive idea to miraculously pop into my head.. (why yes that happens to me, doesn’t that happen to you?) I had some ok ideas for the top: buy a soapstone or granite top for it ($$$), find some reclaimed thick wood ($$$) but I was still stuck on what to do with the sides… I could get one full side by using both halves on one side but then what to do with the other side…what about the crappy baseboard? Replace with feet? Ok so can you feel my pain / frustration? Sometimes a piece goes through many evolutions (mostly in my head) before it settles on what needs to happen. 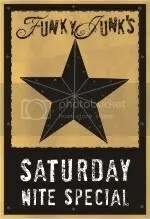 Eureka!, I needed to work that word into a post somehow ;), it came to me! 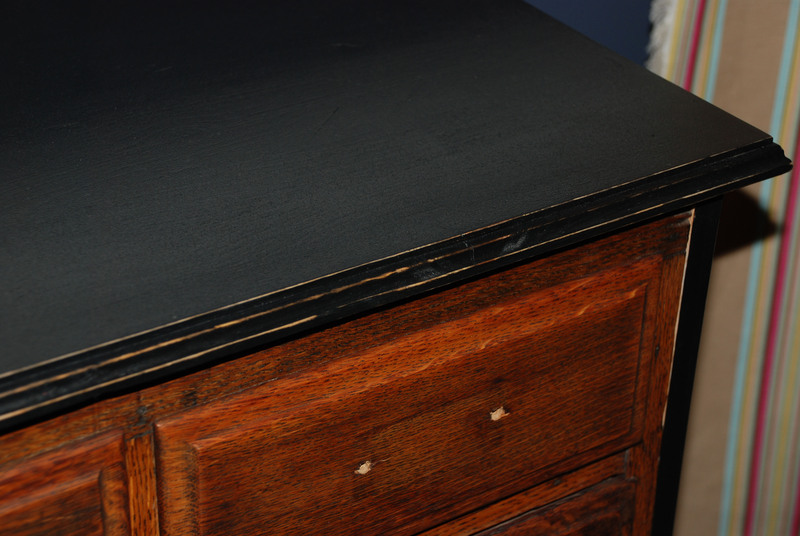 Build a cabinet around the original main piece and paint it black.. we could use inexpensive pine boards and put ogee edge on the top to dress it up! I called my neighbor and she thought it was a good idea… When my husband went to get wood he picked up enough to make two, a total of $80 for both! My super awesome hubby (SAH) removed the old crappy base, that someone had added years ago, the half sides and top. He cut the new top to create an inch overhang and used the router to put the decorative edge on it. The sides and base got new boards as well. Everything was nailed on, but not glued in order to protect the integrity of the original antique… I just felt like that was important. Then came the “hard” work ;), I filled the holes and sanded the piece down. In the meantime super awesome hubby (SAH) helped the neighbor’s husband bring their piece down and did the same thing for them… it’s amazing how fast it goes the second time around! We got our piece inside and I painted the new wood in satin black. I did a VERY little bit of distressing along the edges and waxed and buffed the piece… Ok.. At this point remember I didn’t have all of the pulls (and truthfully I didn’t like them anyway) so I took off all of the label pulls, listed them on CL (sold!) and began looking for new ones… Do you KNOW how much pulls with labels cost? How about how hard it is to find them with a 2 7/8″ spread? I have 25 drawers… Let’s just say I will spend more on pulls than I did on the entire piece… and I will STILL feel like I got a deal! I STILL haven’t found the label pulls I want! But here is the after picture without the pulls… The chest is made from solid tiger oak and is really quite awesome! Oh yeah.. My neighbor liked the pulls so she painted hers ORB (they were brass) and they came out great! Just so you know…we hemmed and hawed about what to store in the piece and finally settled on Christmas tree ornaments! It is in our basement and the tree will be setup right next to it.. I think this will work, otherwise what would I put in the drawers? Dog treats ;)? Wow, I don’t even know what to say…I’m SO jealous 🙂 In a good way, promise! 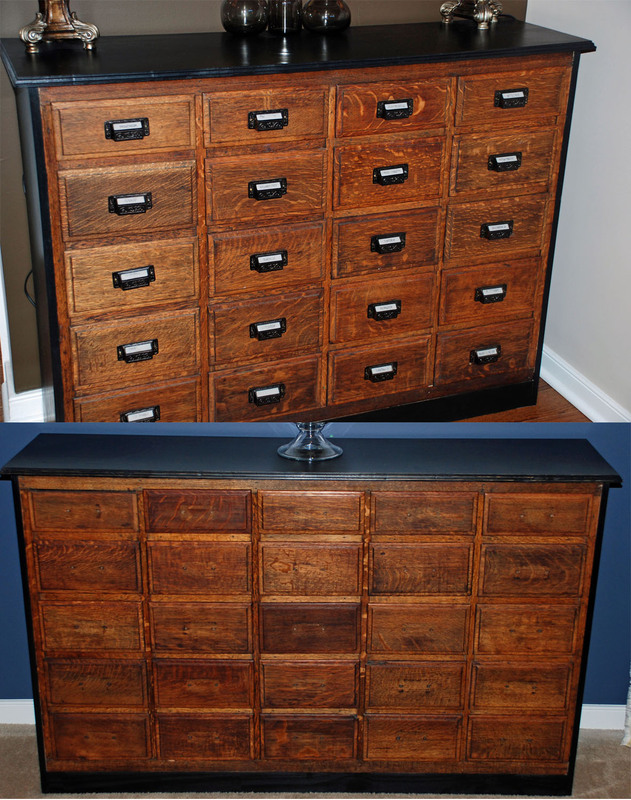 I love furniture with lots of drawers, I would have peed my pants if I would have scored this amazing chest! Thanks for sharing. I love your furniture pieces! You’ve done a beautiful job restoring them. Dang, I thought you were going to end with your neighbor not knowing what to do with hers so she sells it to you for a song! Cause you know I’d want it all!!! Ha! Seriously, they both turned out great! I know what you mean about thinking about a project for-ev-er, I’m the same way and ideas to come up and I’m glad I didn’t go ahead and do it a different way cause the new idea is aw-some!! And I have faith that you will find a fantastic solution to the pulls. Good luck, Susanne. You have no idea how jealous I am!!! OMG, how beautiful is that! I’m do excited to see this post! I’ve got one that’s been in my fam a long time. (Mom stored Christmas ornaments in it – I’ve got a whole bunch of random things in it now that it’s mine.) We’ve always called it “the thing with all the drawers”. The hubby & I were wondering what it’s real name was and I found your site when looking. I’m interested to know what your neighbor did to her pulls. Mine are faded and those look nice. You don’t still have any of yours left? 2 out of the 25 have always been different. Hi! What a lucky person you are! I sold my pulls, but my neighbor sprayed hers in oil rubbed bronze spray paint. Check Etsy or EBay for more knobs… I think I remember seeing some. I’m glad to hear someone else stored ornaments in them too! It is a VERY sought after piece and can be worth a lot… Hold onto yours! Good luck! Thanks so much! I can’t wait to see what kind of pulls you end up with. I think I might spray mine once I find 2 replacement pulls. Your neighbor’s looked so good. I’ll probably do a silvery finish. The wood on my piece is a lot darker than yours and all the other pulls in the house are silver. When my mom had it I’d say 20 of the 25 drawers held ornaments and other Christmas stuff. We’ve got everything in ours: tools, extension cords, DVD’s, baby books, potty-reward candy, art supplies. I like your idea of building a cabinet around the drawers great tip to take away. It turned out beautiful. Regarding pulls I think some polished rubbed bronze would set it off nicely. By now you have probably found some knobs. Good luck.